Today our guests are Jaime Andrews and Philipp Imbusch, box-owners of CrossFit FRA, giving us a little insight into what happens at their BOX! Jaime Andrews and Philipp Imbusch, the box-owners of CrossFit FRA, are giving us a little insight into what happens at their BOX! Enjoy another episode of our Europewide BOX interviews. I started CF 4 years ago in California, a friend recommended it and I was hooked from day one. My boyfriend Philipp and I met at a CrossFit BOX in Frankfurt, we realized that we had the same passion with Crossfit and coaching. The stars aligned for us to then open a box 1.5 years later. We have a great coaching staff, we have every certification CrossFit offers and Philipp is also on the CrossFit level one seminar staff. From our services we always wanted to offer a one stop shop for all client need; and if we don’t have or know it, our network locally and globally is so diverse we are sure to always find a solution. We also have a true community. There is friendly competition with in our box but in the end we support each other. Our environment with in the box is familiar, diverse and inclusive. Most of all..WE HAVE FUN! Funny, we actually just checked where we were at and we have about 90 people so far! We have a good balance of young and old but predominantly the urban professional between 25-35. We have a team that’s is training for the regionals aswell as other European events. We offer a yoga classes aswell as an Olympic weightlifting club. As we grow we will also offer CrossFit for Kids. Everyone that is new to CrossFit is required to complete our foundations program. This covers all 9 foundational movements along with CrossFit specific movements. Once that is completed you are able to jump into our normal WOD classes. From there every class you attend the coaches will scale all weights and movements appropriately for your skill level so you are able to compete all movements in a safely manor. We have not done any competitions yet at our box but we have hosted fundraisers e.g. hotshots 19 and lift up Luke. The next competition will be hosting the 2014 open workouts at our box for competitors in the area in combination with our sponsors. Yes, we are well connected wishing the community and are always on the lookout for new and more friends! Absolutely if your in the area or if you have a layover at FRA airport, we have a direct train that takes you to our train stop Aprox. 20 min. 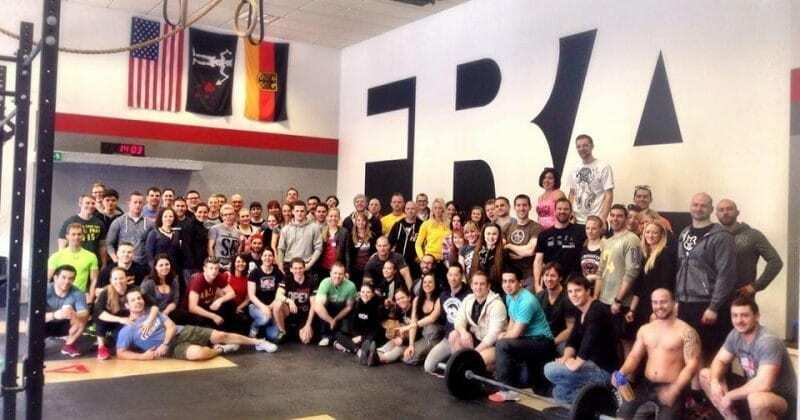 Contact Jaime or Phil via email jaime@crossfitfra.de phil@crossfitfra.de also be sure to check out http://cffra.frontdeskhq.com for an up todate schedule and class times.